Water is a natural resource needed by everyone to meet their health needs. These include our body structure, sleep and also regeneration. It is obvious that water is one of the most essential elements of human life and vital to our survival. The human brain consists of 95% water, the lungs have 90%, the blood has 83%, our muscles have 76%, and our bones have 22%. These percentages are a clear indication of the vital importance of water in our body for maintaining good health. Unfortunately, most people drink much less per day than they should. The result is an alarming increase in cases of dehydration. In this article, we will take a closer look at how water intake affects your whole health. Excretion: One person can excrete several liters of urine per day. Breathing: When we inhale the air is moistened on the way through our lungs. With each breath, our body loses a small amount of water and easily over half a liter per day. Sweating: In the regular activity, our body loses around half a liter of water a day by sweating it through the skin. In a high activity such as sports or high temperatures, this value can easily increase significantly. Digestion: Normally we barely lose any water over our metabolism. Due to illness, vomiting or diarrhea which can easily lead to fluid loss of several liters. Water absorption needs always depend on how the individual loses water. If dehydration occurs, the lymphatic system responsible for balancing water ensures that the most critical parts of the body have enough water and restricts water availability in other areas. This leads to a general loss of performance, which is felt for example by fatigue. Symptoms such as headache, fatigue, lack of concentration, weakness and in some cases, fainting can occur. Optimal water intake is more than just quenching thirst. It affects many health aspects. Water is the main constituent of our blood, which in turn provides for the transport of oxygen, nutrients and breakdown products. Water regulates body temperature: Through sweat production and evaporation, our bodies avoid overheating. The blood is cooled via our skin and ensures that the body temperature and blood are balanced. Water helps to lubricate our joints: Water helps to cushion and protect sensitive body organs. The right water supply has a positive effect on our productivity. Scientific studies have shown that optimal water intake improves our mental health and has a beneficial impact on our cognitive functions. Other benefits are more focus, better skin hydration, better digestion, and so much more. How do you ensure ideal water intake? 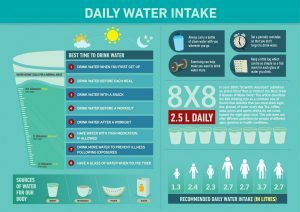 With a general increase in health awareness, topics such as nutrition and physical activity more and more people are becoming increasingly alerted to water intake. However, even among the more conscious among us, lack of water intake is constantly a problem. Here are some practical tips on how to ensure adequate drinking. Care for taste! To make the water tastier, it can be spiced up with natural herbs or fruit additives. EAT more water. Eating watery foods is an excellent way to increase overall water intake. Make sure that every time you shop, buy fruits and vegetables that contain a lot of water. These include watermelons, zucchini, cucumbers, grapefruit, strawberries, and lettuce. Install a drinking reminder App. There are a variety of such apps for Android and iOS, such as Waterlogged or Hydro Coach, which you can install for free with little effort. The apps remind you to drink regularly. Drink before the thirst comes! Thirst is already a sign that the body no longer has enough water, i.e., is dehydrated. To avoid this, one should regularly drink without thirst. How much water a day should you drink? As with most things, it varies from person to person, and there are many factors (both internal and external) that ultimately affect our daily water needs. I want to refer to some water intake studies, and how it affects the functions of our body and brain. Then, explain how to adjust quickly and if necessary, how to increase daily water intake to your own needs. The opinions about the individuals optimal drinking quantity per day varies. At least two liters per day should be about right for adults. How much water per day is the optimal amount for yourself depends on many factors to make a general recommendation. Here are just a few guidelines. Children should drink between one and 1.7 liters of water per day, depending on their age and size. This is roughly equivalent to four to six glasses. Adults: While men need about 3 liters a day, most women use 2.2 liters of water. That’s about 13 glasses for men and about nine glasses for women. Pregnant women should drink about 2.3 liters a day, which is about nine glasses. However, this includes the recommended three glasses of milk or a calcium-containing soy drink. During physical activity, the water intake should be at least 2.7 liters or 11 glasses. Physical exertion leads to higher water consumption, which must be compensated accordingly. When is the optimal drinking time? 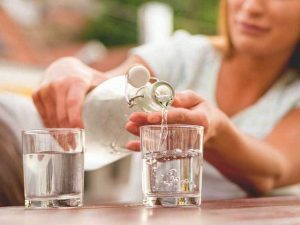 During one day, there are several times when drinking is recommended for optimal hydration. After getting up to activate the internal body organs. Before swimming to lower the blood pressure in the body. Thirty minutes before a meal to stimulate digestion and about an hour after eating so that the body can better digest nutrients. Pre-bedtime to prevent fluid loss during the night. With these drinking habits, you will get your metabolism up to speed, have more energy, better digestion, and more beautiful skin. How much you drink water per day? Let us know in the comment below!